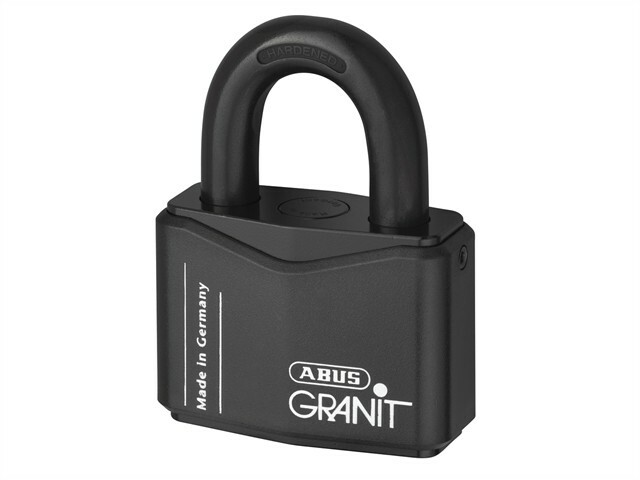 The ABUS GRANIT™ Plus Padlocks offer the highest protection against manipulation. The cylinder is inserted from the top offering optimum drill and pull resistance. The body and shackle are both made from hardened alloy steel with a cataphoretic coating and rust free components which give 40 years of corrosion protection. All GRANIT™ padlocks endure a -40° freeze and impact test, and are bolt cutter, drill and saw resistant. Ideal for securing valuables/goods of great value or at a very high risk of theft, warehouses, factory gates, containers and lorries. Meets special requirements of insurance companies.